Koichi Ishizaka is a specialist of North and South Korean politics and relations. He gave a lecture “Present and Future Japan-Korea Relations” at the HPI Public Lecture Series 2006 (2nd semester) entitled “Brighten the Future by Overcoming Negative Historical Legacy: Mutual Understanding and Peace Building between Japan and Korea” on November 7, 2006. 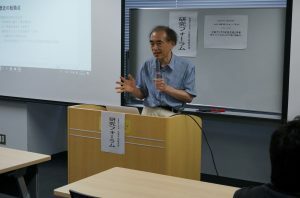 He is the author of many books including: Koichi Ishizaka (ed.) The 51 Chapters to Understand North Korea (in Japanese), Akashishoten, 2006; and Koichi Ishizaka et.al. (eds.) The 60 Chapters to Understand Contemporary South Korea, 2nd edition (in Japanese), Akashishoten, 2014. Yukiko Tsutsui was born in Tokyo. She joined “Earth Tree”, an NGO for international cooperation in Kanagawa Prefecture in 1995, and participated in the “Relief Campaign Committee for Children,” which is composed of many organizations including Earth Tree, in 1997. She served as an administrative staff of the international conference of NGOs’ humanitarian aid to DPRK (North Korea), held in Tokyo in 2000. She has been Secretary General of “Tomodachi-Exhibition”, an exhibition of paintings drawn by the children of North & South Korea and Japan, since 2001, and has been regularly visiting North Korea to promote the linkage between the people of Japan and North Korea. 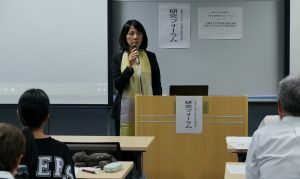 Aki Miyanishi was born in Kanagawa Prefecture, majored in the history of social movements at university, and picked up the issue of Japan-Korea relations for her graduation thesis. After working for companies in the communication and internet business, she joined JVC in 2013, and since 2014, she has been engaged in projects in Korea, and visited Pyongyang for five consecutive years for the preparation of the “Tomodachi-Exhibition”. She was assigned the Manager of the Public Relations Group in 2017. Despite the crisis situation caused by the nuclear and missile tests by North Korea, there has been a positive trend for the possibility of a dialogue between the US and North Korea after the successful meeting of the leaders of both North and South Korea. There is a growing expectation of peaceful solution for the tension in the Korean Peninsula. Given the situation, it is worthwhile to invite a scholar on Korean issues to learn what is going on in Northeast Asia. 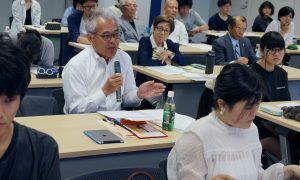 Besides the academic lecture, it is also interesting to hear the experience of “Tomodachi-Exhibition”, an important project by civil society of Japan, South Korea, and North Korea. The “Tomodachi-Exhibition” is an exhibition of paintings drawn by the children of Japan, South Korea and North Korea organized by NGOs and citizens’ of the three nations in the last 17 years. 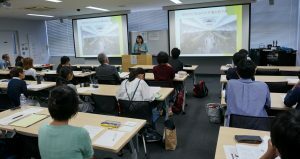 We can learn the important role of citizens’ interaction for the peace of Northeast Asia through the experience of “Tomodachi-Exhibition” from the staff of the NGOs.